Home / Games / Zombie Catchers: Let’s go hunting! Zombie is the favorite topic of filmmakers and game makers. They used to be humans, but because of a virus, they fell into a “half-dead, half-alive” state, meaning that the body can still function normally but has lost consciousness. The only purpose of zombies is to eat living creatures and spread the disease by biting living creatures. Of all the games or movies that I know, zombies don’t fear anything. They rush towards the prey whenever they are attracted without caring about the surrounding. However, have you ever thought of anything that could make a zombie feeling scare? 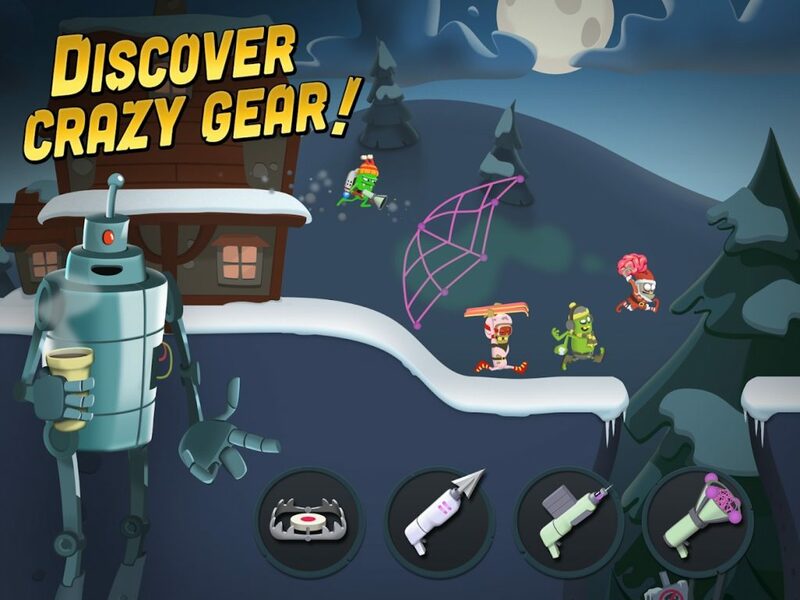 It is the main character in Zombie Catchers (MOD Unlimited Money) – the extremely funny game of the publisher Two Man and a Dog and developed by a game studio in Finnish. The story of the game is quite weird and crazy. If zombies in Stupid Zombies are called dull zombies, then I can call zombies in Zombie Catchers as cowardly zombies. The Earth is ravaged by the zombie epidemic, which puts humans at risk of permanent disappearance. Fortunately, we have help from other planets. 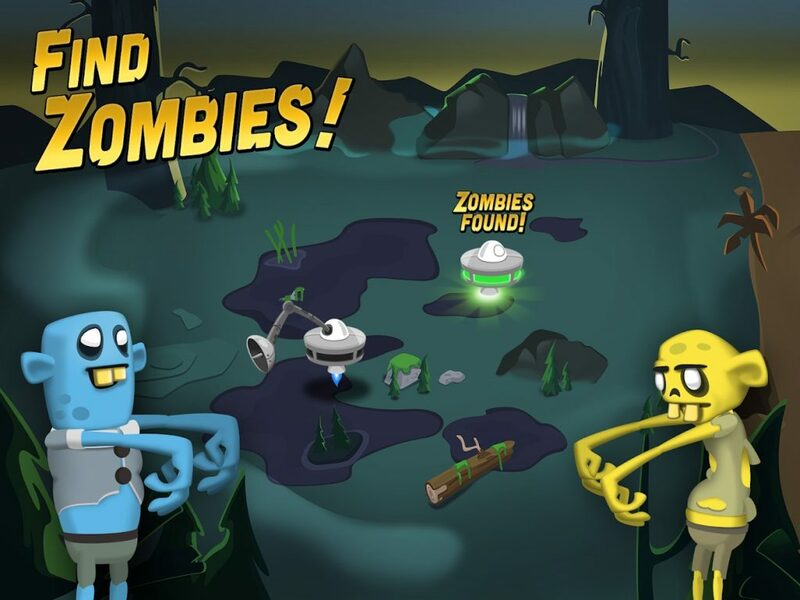 A.J and Bud – two galaxy entrepreneurs plan to catch zombies on Earth. But their purpose is not to save mankind but to make a profit. How? 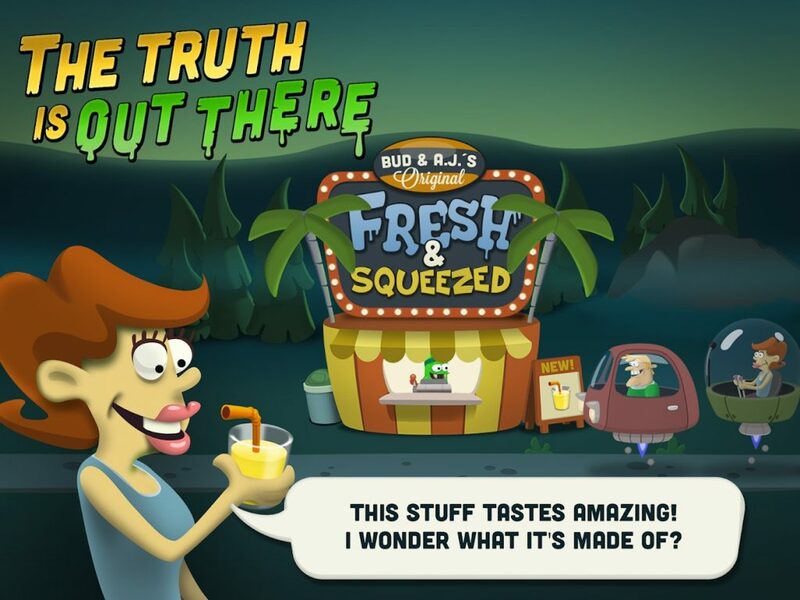 They use zombies to make zombie juices, a favorite alien drink. Zombies have eaten too many human brains, now is the time to “eat” them. In contrast to the usual scary of zombies, every time they see the two main characters in this game, the zombies all feel scared and find a way to escape. In this game, you are either A.J or Bud. Your mission is to catch all the zombies required at one level, then you can advance to the next level. 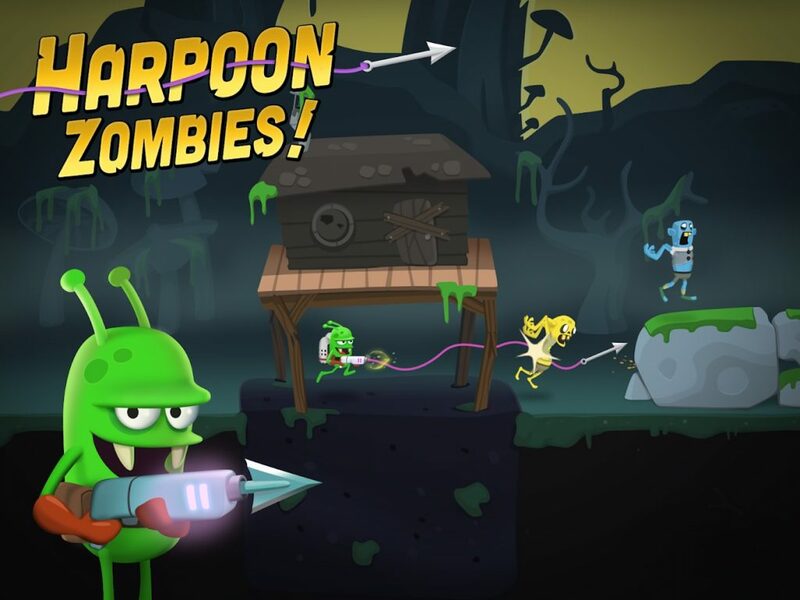 The gameplay of this game is quite similar to puzzle games, which means you need to solve the problem as quickly as possible, here is to catch the zombies with a harpoon. First, you need to lure them out of hiding places with brains. When you catch a zombie, they are tied and flew into the air with a balloon. After that, your colleague will drive the spaceship into and grab them. You can buy some other devices like nets, electric guns, anesthesia guns, traps, bombs, … when you have more money. There are many different types of zombies, but that doesn’t affect your strategy. Watch out for zombies with weapons! Some zombies are able to throw stones or sticks on you, causing you to be paralyzed for a few seconds. If you encounter this type of zombie, find a hiding place, wait for them to throw stones and then catch them. Zombies in Zombie Catchers are quite sensitive, they can recognize your presence within a certain distance. After you drop the brains to trap them, quickly hide behind a large rock or a tree. If they know you are there, instead of eating the brain they will run away or not even appear. At some levels, there are quite a lot of obstructing animals like snakes and bats. If you touch them, you will be paralyzed for a few seconds. So I think you should clean them up with your gun or spear right from the start of the game. This makes your zombie catching process unimpeded, at the same time, it gives you some coins. Plutonium is premium money in the game. This currency is quite hard to earn, you should take advantage of it to upgrade weapons or buy special weapons, such as increasing the number of hooks for your harpoon. In our Zombie Catchers MOD, the game gives you infinite money to help you unlock and upgrade everything you want. However, you need to have the required level of each weapon if you want to unlock them. 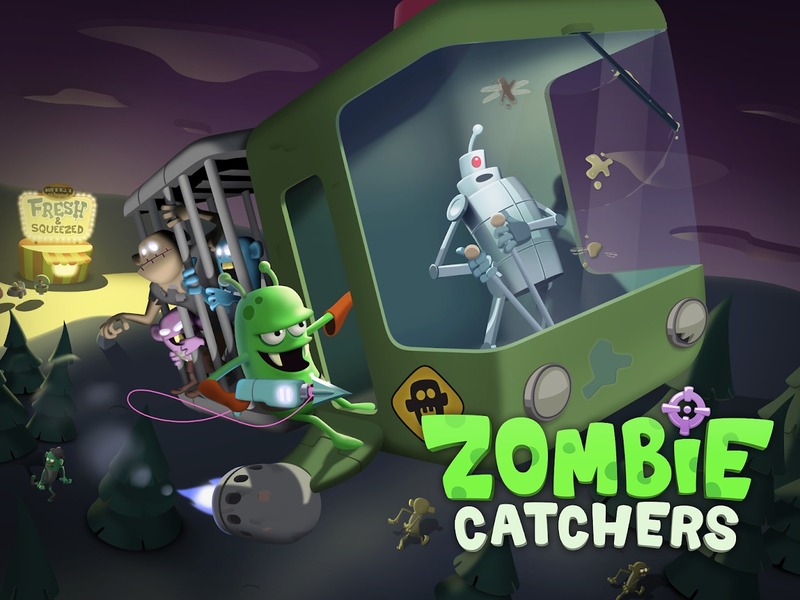 Zombie Catchers has good 2D graphics, simple console, and cute music. The game is a great choice if you are looking for a game to relax after a stressful and exhausting day of work. Are you ready to open a Starbucks store with the favorite drink that is a zombie juice?